Brrr! Cold weather is upon us, with the official start of autumn, and I can feel it in the air. The city where I live once hosted the winter Olympics, so we know from cold, as old Yiddish ladies would say. Here are five frugal ways to stay warm and cozy without setting your heating bill on fire. Whether it’s your sweetie-pie while watching TV, your kids during bedtime story hour, your cat while you’re trying to read the newspaper or even just a pillow in bed, having something next to you can be an excellent way to stay warm. Try it tonight- snuggle up to a few pillows against your body- they will definitely help to retain heat, especially if the pillows are under the covers with you. As have said countless mothers: “You’re cold? Put a sweater on.” Dressing in layers can be more effective than wearing the equivalent thickness of clothing in a single layer, because each layer traps air. Your body heat then warms that air; eventually your clothing will feel like a cozy down comforter. So start out with a tank top, then add a tee shirt, then a sweater, then a sleeveless vest if need be. Don’t forget to act French either- a scarf draped stylishly around your neck does wonders at keeping you warm. The other advantage to wearing layers is that it’s easier to remove just a little bit of clothing when you start to get too hot. Another famous mother tactic is to turn down the thermostat. This is one of the best ways to save money on your heating bills, although you then need to employ the other measures mentioned here in order to keep from turning purple with cold. The best way to reset the temperature of your house is to lower it gradually. Delay as long as you can before you turn the furnace on for the first time, then set it as low as possible. If you don’t have an automatic thermostat you should get one. If your house is like ours and automatic thermostats aren’t possible, then make it a priority to lower the heat before going to bed at night and before leaving the house in the morning. What? Did you think that after I told you to turn the heat down in your house I would then tell you to turn it up? Not today. Instead of heating yourself up from the outside, try warming things up on the inside first. Now’s the time of the season for thick, hearty soups, chunky, spicy chili, cheese and potatoes, potatoes and cheese. A favorite French recipe from this region involves melted cheese on little individual table burners, then eating it on steaming hot boiled potatoes with cold cuts. I dare you to feel cold after a meal like that. There are many ways for a cold draft of air to sneak into the house: under the door, through the edges of the window, up from the floor. Block as many of these as possible! Now’s the time to throw an extra rug (or two or three) down on the tile floor. You can make cheap draft stoppers for the door by rolling up old towels lengthwise and tying them with pretty ribbons or even twine, every few inches until you have what looks like a very large sausage. French houses almost always have wooden shuttters for their doors and windows, these help immensely in keeping out the cold. Add another layer to the window with curtains, or even hang an old but pretty quilt up on a curtain rod. Make sure to keep doors closed to any unused rooms as well. Looking for more tips? David from My Two Dollars has ten ways to save money on heating bills this winter. How do you combat the cold? What are your frugal heat-seeking tricks? I’m old school and say: PUT A SWEATER ON! The worst person to complain about the cold is hubby. Another suggestion is to keep moving. Do the dishes – fold the laundry, I find if I just sit I get colder faster. Great tips! Especially since I woke up this morning FREEZING cold. We have a small energy efficient space heater we use once the temp really drops. That way we can keep the heat on a lower setting and just warm the room we are hanging out in (this is especially good for the bathroom – nothing worse than getting out of the shower into a freezing cold room). If there is a room you don’t go into often you can also block it off by closing the door or hanging a blanket to keep other rooms more cozy. Great post. 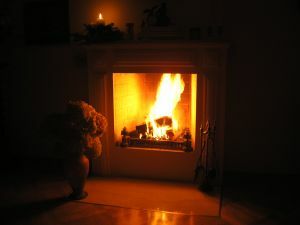 Build a fire in your fireplace and turn down the thermostat. Make sure your beds have warm blankets………keep your home temp at about 55 degrees at night……. Thanks for the link – gotta go start a fire now! We used to make draft-stoppers by sewing some fabric into a tube, filling it with sand and sewing it closed. Those heavy little suckers stopped drafts coming in from 200-year old windows! Plus, we used leftover quilt fabric, so they sort of coordinated with the rooms. I can’t stand being cold because I have Reynaud’s and my fingers go all waxy and numb with purple nails when my hands get cold (yeah, I know, incredibly attractive and it even happens inside sometimes) but I love warm food to warm you up from the inside. We were cold in our city place when we first moved in (in Feb last year). This year we have our bookshelves up against the outside wall. They’re full of books and I have doors to add to the bottom half of each bookshelf. (IKEA, Billy bookshelves with Byom doors.) I bought long drapes that will go down behind the sofa (the curtain that came with the place just fits inside the window and isn’t lined). I just have to remember to pick up a *rod* so I can hang the drapes. All of that should help keep in the heat this winter. I love this post Kelli. I’m looking forward to using lots of cozy quilts this winter. As a Canadian, I would say layering up is the most important tips. It works, trust me! These are all great tips. The one I would add is “Move It””. Nothing helps me warm up like physical activity – housework, exercising, dancing, romping with dogs or kids, etc. “Breaking a sweat” when it’s cool out takes effort but feels so good! Nothing feels better than raising your internal thermostat when it’s chilly outside. Bloodflow hen it is cool out is a great way to warm up! Nice list of tips to prepare for the winter months! I see you are using the thesis theme as well. How do you like it? I have been using it now for about 1 month and love it! A favorite French recipe from this region involves melted cheese on little individual table burners, then eating it on steaming hot boiled potatoes with cold cuts. Mmmm, raclette! I miss that from my time in France. Come to think of it, the French know a lot about keeping warm. The scarf thing is very true (there’s also a small obsession with Burberry patterns, or there was when I was there, at least). There’s also a strong preference natural fibers, like wool. Another recommendation: small, localized sources of heat, like a space heater, heating pad, heated mattress pad (I love mine), or a kotatsu (heater/table thing that the Japanese use) can be incredibly efficient. No need to heat the whole house. Keep your head warm! A huge % of your body heat is lost through your head. ; there’s a reason that people used to wear nightcaps to bed! Cute beanies are a good modern subsititute. If you are or know a knitter, ask think caps for a gift that warms both body and heart.